Malaysians for Beng Hock is a citizen’s initiative with the aim of pushing for justice for the late Teoh Beng Hock and his family, which until now is still being denied. Teoh Beng Hock was a political aide to a Selangor state executive councillor, who in July 2009 died mysteriously after spending a night and enduring a marathon questioning session at the offices of the Malaysian Anti Corruption Commission in Shah Alam as a witness to a case. We are officially moved to teohbenghock.org and initiated a “royal commission watch” project to closely monitor the performance of the TBH royal commission of inquiry. Please follow the new website to obtain the latest information. We will stop to update this blog. You are invited to send journalists to cover the launch of Teoh Beng Hock Royal Commission Watch Panel & Website. 2. The objective of setting up the RC watch panel is to closely monitor the performance of RCI to ensure truth and justice for Beng Hock The RC watch panel consists of seven experts from various background, three of them will attend the press conference : Dr. Irene Fernandez, Dr. Toh Kin Woon and Dr. Ronald Mccoy, we will disclose the full details in the PC. 3. Please contact me if you have any queries. The Malaysians for Beng Hock movement strongly question the investigative direction of the Royal Commission which leads to a verdict of suicide. The attempt to use unscientific evidence to prove the deductions and claims of MACC in the absence of Teoh Beng Hock, is totally immoral and against the professional ethics of law and forensic psychiatry. This is because any third party information, which is usually inadmissible in court, including the interviews targeting relatives and friends could be twisted to give unfair advantage to MACC’s assertions and claims. We would like to remind the RCI chairman James Foong, when he allows expert witness testimony, he needs to refer to US federal court judgement Daubert v. Merrell Dow Pharmaceuticals in 1993 which is the most common reference for expert witness testimony. The Daubert standard is one of the main references of American Academy of Psychiatry and Law. 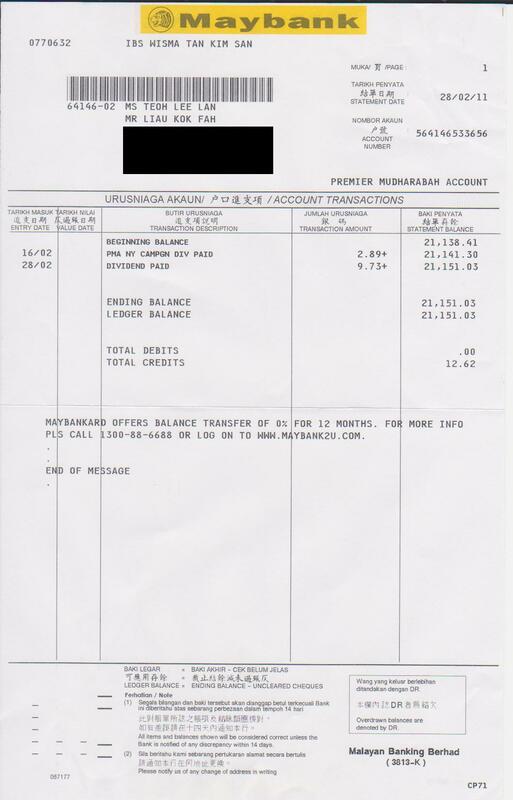 Please see our bank account statement on 28 Feb 2011. Sorry for did not update previous few months because busying for campaign. Some program expenses and T-shirt payment have not cleared, will update the account again later on. Perdana Menteri, Datuk Seri Mohd Najib Razak dilabel ibarat sekadar ‘menanam tebu di tepi bibir’ sahaja apabila dilihat masih tidak mampu menunaikan janji yang diberi kepada keluarga mendiang Teoh Beng Hock sewaktu pertemuan kali pertama dengan keluarga itu. Dalam program Fokus Berita, terbitan TV Selangor, adik pembantu politik itu, Teoh Lee Lan berkata, jika perdana menteri ikhlas mahu membantu menyiasat, beliau sepatutnya memenuhi segala permintaan yang dibuat keluarga mendiang supaya dapat menyelesaikan kes itu secepat mungkin. “Ini keikhlasannya tidak dibukti dengan perjalanan inkues sepanjang setahun lebih, sekarang Suruhanjaya Diraja menolak semua permintaan kami hanya kerana mereka tidak mahu kes ini ditukar lagi tetapi pada asalnya siapa yang menukarkan keadilan, kebenaran sepanjang kes ini,” katanya. Lee Lan juga turut mempersoalkan sebelum Suruhanjaya Siasatan Diraja ditubuhkan, inkues Teoh Beng Hock jelas menunjukkan mereka hanya menjalankan siasatan yang disifatkan sebagai berat sebelah. “Semua orang boleh lihat bagaimana inkues menjalankan tugasnya dan anda beritahu saya, adakah mereka menyiasat dari segi membunuh diri atau dibunuh, jawapan yang sangat nyata, mereka hanya menyiasat dari segi dibunuh. “Perdana Menteri meyakinkan kita bahawa inkues akan memberikan satu jawapan tetapi tidak, malah dianggap tidak munasabah. Kemudian beliau (PM) berjanji untuk menubuhkan satu siasatan suruhanjaya diraja untuk menyiasat kematian Teoh Beng Hock,” katanya. Turut menemani beliau adalah, Penyelaras Rakyat Menyokong Beng Hock, Eng Yap Hwa. Sebelum ini Najib menemui anggota keluarga mendiang Teoh Beng Hock di Pejabat Perdana Menteri pada 28 Julai tahun lalu. Pada pertemuan itu, Najib menyampaikan takziah kepada bapa pembantu politik DAP itu, Teoh Leong Hwee, emaknya, Teng Shuw Hor, abangnya, Beng Kee, adik perempuannya, Lee Lan dan juga tunangnya, Soh Cher Wei. Teoh, 30, setiausaha politik anggota exco Selangor Ean Yong Hian Wah, ditemui mati pada 16 Julai 2009 di koridor tingkat lima Plaza Masalam, Shah Alam, Selangor selepas memberi kenyataan di pejabat Suruhanjaya Pencegahan Rasuah Malaysia (SPRM) yang terletak di tingkat 14 bangunan itu. Who’s disrespecting the King here? FEB 28 — Let’s get one thing straight. The Agong or any of the Malay Rulers may have a special position under the Constitution but they are not God. For God-fearing Malaysians, only the Almighty is infallible. With that concept set out (for the benefit of Utusan Malaysia and its English cousin, The Star) I would like to address the current debate on whether Teoh Beng Hock’s family have disrespected the Agong by not being party to the Royal Commission of Inquiry. Former judge Shaik Daud says the family has disrespected the institution. I don’t think so because it was always going to be possible for them to walk away from a commission hearing they did not institute (done by government) or agree with. If we are to accept Shaik’s argument, should we also say that the governments of Abdullah Badawi and Najib Razak have disrespected the Agong because they did not implement fully findings of the royal commission on the police or the findings of the VK Lingam commission? In fact, it seems to me that the Agong should be angry with the government because whenever they find themselves in a bind, they go for an RCI but are very lame-willed about implementation. By doing so, they have made the RCI a laughing stock. In the Teoh case, the RCI is stocked with judges and government officials. So I do wonder who is really disrespecting the Agong? * Jacob Sinnathamby reads The Malaysian Insider. * This is the personal opinion of the writer or publication. The Malaysian Insider does not endorse the view unless specified.